In this tutorial we will show you how to install and configuration Google Chrome on Ubuntu 16.04. For those of you who didn’t know, Google Chrome is a freeware web browser developed by Google, uses the WebKit layout engine. It is available for the Linux, Android, iOS, Microsoft Windows, and Mac OS X operating systems. But Google Chrome is more than a web browser, as it combines sophisticated open source technology, borrowed from the Chromium application, into a minimal design, all in order to help users surf the web much faster, a lot easier, and safer than ever before. This article assumes you have at least basic knowledge of linux, know how to use the shell, and most importantly, you host your site on your own VPS. The installation is quite simple and assumes you are running in the root account, if not you may need to add ‘sudo’ to the commands to get root privileges. I will show you through the step by step installation Google Chrome on a Ubuntu 16.04 LTS (Xenial Xerus) server. Step 2. Installing Google Chrome. 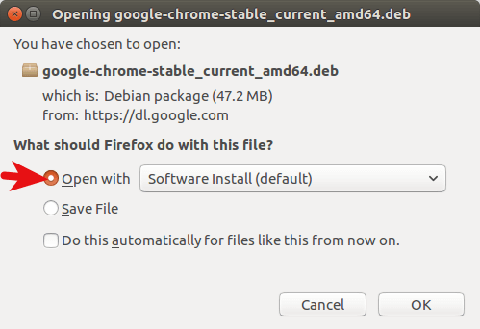 If you choose the first option, Google Chrome deb package will be downloaded to /tmp/mozilla_$username directory. Once the download is complete, Ubuntu Software will automatically open. Click the Install button to install google-chrome-stable to Ubuntu 16.04. The version and installation size information can be seen in the Details section. 189.4MB of disk space! That’s huge for a Web browser. Congratulation’s! You have successfully installed Google Chrome. Thanks for using this tutorial for installing Google Chrome web browser control panel in Ubuntu 16.04 system. For additional help or useful information, we recommend you to check the official Google Chrome web site. Related Posts of "How To Install Google Chrome on Ubuntu 16.04"